Korea is no longer a homogeneous nation. These days, foreigners often appear on television, showing their talents in various entertainment programs, joining Korean pop groups, making people laugh in variety shows and even acting in films or television dramas. David Kenneth Levene Jr., commonly known as “Dave,” arose to fame as a YouTube star with 170,000 YouTube subscribers and 800,000 “Likes” on Facebook. He gained popularity through his YouTube videos, where he talks about his thoughts on everyday Korean life in almost native Korean. With the Korean name, “Deok Young-bae,” he is widely recognized in Korea. 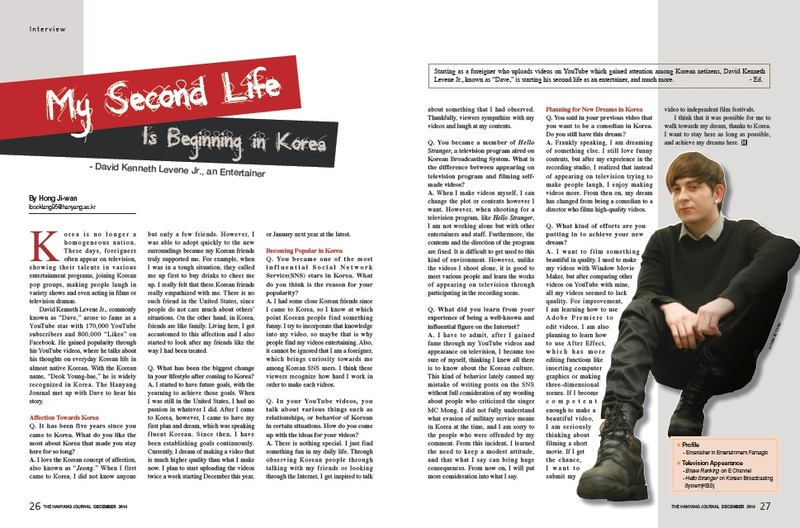 The Hanyang Journal met up with Dave to hear his story. Q. It has been five years since you came to Korea. What do you like the most about Korea that made you stay here for so long? A. I love the Korean concept of affection, also known as “Jeong.” When I first came to Korea, I did not know anyone but only a few friends. However, I was able to adopt quickly to the new surroundings because my Korean friends truly supported me. For example, when I was in a tough situation, they called me up first to buy drinks to cheer me up. I really felt that these Korean friends really empathized with me. There is no such friend in the United States, since people do not care much about others’ situations. On the other hand, in Korea, friends are like family. Living here, I got accustomed to this affection and I also started to look after my friends like the way I had been treated. Q. What has been the biggest change in your lifestyle after coming to Korea? A. I started to have future goals, with the yearning to achieve those goals. When I was still in the United States, I had no passion in whatever I did. After I came to Korea, however, I came to have my first plan and dream, which was speaking fluent Korean. Since then, I have been establishing goals continuously. Currently, I dream of making a video that is much higher quality than what I make now. I plan to start uploading the videos twice a week starting December this year, or January next year at the latest. Q. You became one of the most influential Social Network Service(SNS) stars in Korea. What do you think is the reason for your popularity? A. I had some close Korean friends since I came to Korea, so I know at which point Korean people find something funny. I try to incorporate that knowledge into my video, so maybe that is why people find my videos entertaining. Also, it cannot be ignored that I am a foreigner, which brings curiosity towards me among Korean SNS users. I think these viewers recognize how hard I work in order to make each videos. Q. In your YouTube videos, you talk about various things such as relationships, or behavior of Korean in certain situations. How do you come up with the ideas for your videos? A. There is nothing special. I just find something fun in my daily life. Through observing Korean people through talking with my friends or looking through the Internet, I get inspired to talk about something that I had observed. Thankfully, viewers sympathize with my videos and laugh at my contents. Q. You became a member of Hello Stranger, a television program aired on Korean Broadcasting System. What is the difference between appearing on television program and filming self-made videos? A. When I make videos myself, I can change the plot or contents however I want. However, when shooting for a television program, like Hello Stranger, I am not working alone but with other entertainers and staff. Furthermore, the contents and the direction of the program are fixed. It is difficult to get used to this kind of environment. However, unlike the videos I shoot alone, it is good to meet various people and learn the works of appearing on television through participating in the recording scene. Q. What did you learn from your experience of being a well-known and influential figure on the Internet? A. I have to admit, after I gained fame through my YouTube videos and appearance on television, I became too sure of myself, thinking I knew all there is to know about the Korean culture. This kind of behavior lately caused my mistake of writing posts on the SNS without full consideration of my wording about people who criticized the singer MC Mong. I did not fully understand what evasion of military service means in Korea at the time, and I am sorry to the people who were offended by my comment. From this incident, I learned the need to keep a modest attitude, and that what I say can bring huge consequences. From now on, I will put more consideration into what I say. Q. You said in your previous video that you want to be a comedian in Korea. Do you still have this dream? A. Frankly speaking, I am dreaming of something else. I still love funny contents, but after my experience in the recording studio, I realized that instead of appearing on television trying to make people laugh, I enjoy making videos more. From then on, my dream has changed from being a comedian to a director who films high-quality videos. Q. What kind of efforts are you putting in to achieve your new dream? A. I want to film something beautiful in quality. I used to make my videos with Window Movie Maker, but after comparing other videos on YouTube with mine, all my videos seemed to lack quality. For improvement, I am learning how to use Adobe Premiere to edit videos. I am also planning to learn how to use After Effect, which has more editing functions like inserting computer graphics or making three-dimensional scenes. If I become competent enough to make a beautiful video, I am seriously thinking about filming a short movie. If I get the chance, I want to submit my video to independent film festivals. I think that it was possible for me to walk towards my dream, thanks to Korea. I want to stay here as long as possible, and achieve my dreams here.